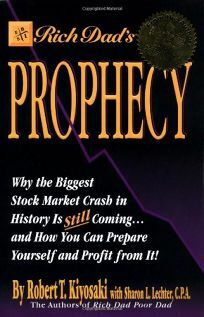 Rich Dad's Prophecy: Why the Biggest Stock Market Crash Is Still Coming and How You Can Prepare and Profit from It! When the first baby boomers celebrate their 70th birthdays in 2016, according to rich dad (the author's financial mentor and father of his boyhood chum), a massive stock market crash will ensue. Joining half a dozen popular Rich Dad books, this volume continues Kiyosaki's eloquent yet simple survival instructions to investors present and future. Kiyosaki's wealth stems from lessons learned at rich dad's balance sheets, and here he deftly illustrates those complex financial truths. He encourages readers-many of whom suffer from what he sees as the dismal lack of financial education in the school system-to understand factors such as ERISA, the investor-unfriendly retirement law for which rich dad vilified the government, and the overabundance of ""white bread"" financial advice for the masses. Wall Street has nothing to gain by smartening up investors, Kiyosaki warns, so it's up to people to educate themselves. Those convinced that reading financial statements is an activity solely for the sophisticated and the moneyed will be reassured by Kiyosaki's analogies-Noah's ark is a primary one-as he colorfully covers a host of investing esoterica and scrutinizes details every investor should recognize. ""Investing time when I had no time, and investing money when I had very little money is what made me rich,"" he says.